That’s was what I said having seen the pin on Maps.me app. At the time I was walking around the Otago Peninsula with Nina. With a little bit more research, we decided to make a quick visit to Nichols Falls (a.k.a. Glowworms and waterfall) before heading to the campsite for the night. Why did I strike out quick in the above sentence? We got so lost! And that’s the reason for this post. I don’t want you to get lost like us. We read other posts on Nichols Falls, but they didn’t prevent us from getting lost! Nichols waterfall is, in theory, a short walk (~10 mins each way) from the road where the trail starts. That’s IF you take the right turn off. If you miss the turnoff, you’ll find yourself like me and Nina, wandering through a labyrinth of trails leading to nowhere (but they must lead somewhere?). So how do you get to get to Nichols Falls? I’ll write about the glowworms later, but first, I’ll get you to the waterfall. I hope. Send me a message on Instagram if these directions helped you! When you arrive the trail head, there’s a sign saying the waterfall and glowworms are 20 and 7 minutes respectively. These are conservative times. 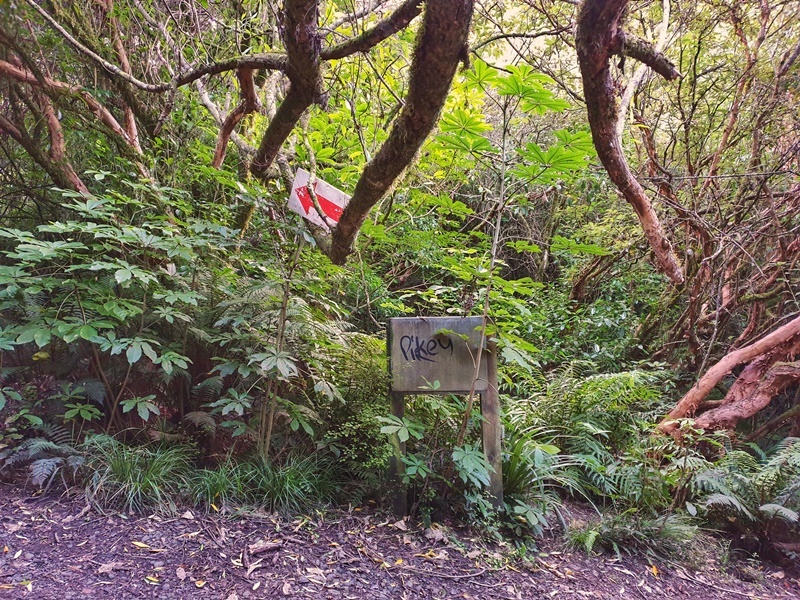 Follow the trail, and after a few minutes, you’ll see a wooden signpost (left-hand side of the trail) and a white sign with a red arrow (see below). The red arrow is pointing to the glowworms, as the signpost is. Turn left when you reach this point. Follow the path and when you reach the T-intersection (takes less than a minute to get there from the red arrow), turn right. After turning right and continuing for a couple of minutes, you’ll see the path splits off in two directions. Take either route as they will join up again in 20 metres or so. When you come to the second section where the trail splits off, stay right! It’s hard to depict this in photos, but I’ve tried here. Follow the right-hand path, and stay right. From here it’s no more than a 5-minute walk until you hit the creek. Once you reach the creek, look left and you’ll see the waterfall. YAY. 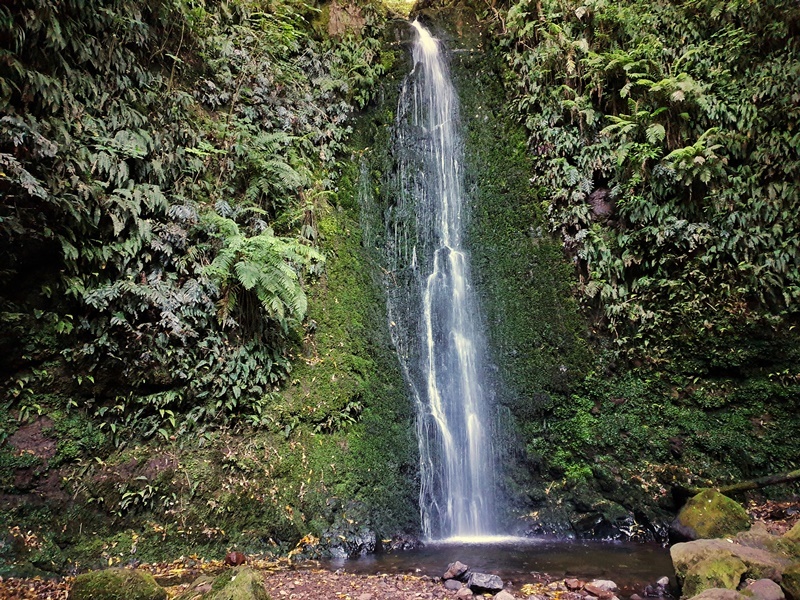 You’ll need to do some rock hopping to across the creek to get up close to the horsetail waterfall. The sign says it’s a 20-minute walk to the waterfall, but really it’s a 10-minute walk (15 max). After the T-section, the key is to go right every time you start doubting yourself. Remember, the walk to the waterfall isn’t long. If you find yourself walking for more than 20-minutes, you’ve missed the turn-off. We were way off track! There were no clear markings indicating the right direction on the trail, so we followed what appeared to be the most well-trodden trail. On maps.me, the waterfall and glowworms were marked at the same location, which in hindsight they kind of are, but this isn’t obvious to start with. We decided to follow the hiking trail marked on the app. We made it to the end of (thinking that might be where the waterfall was) but it led to nowhere (no view, no nothing). On Google we saw this point and decided that was where the waterfall was (it isn’t). 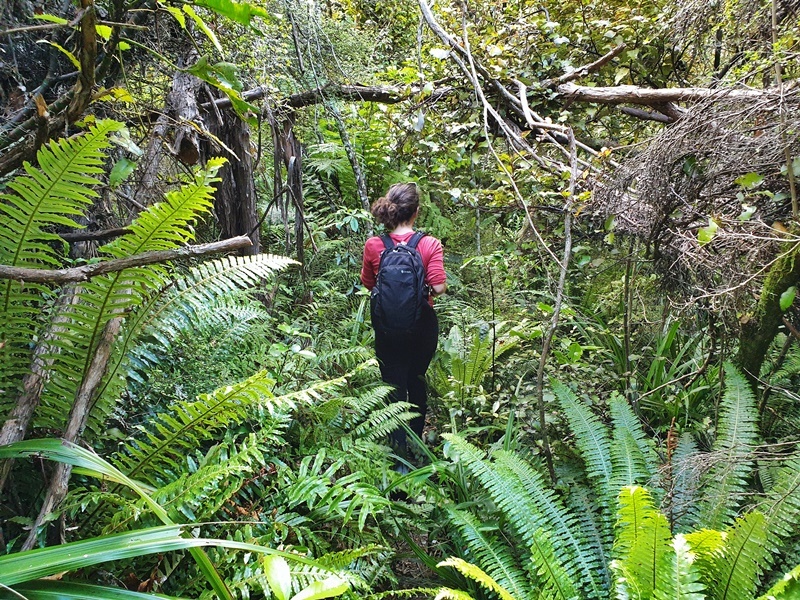 We were trying to find any resemblance of a track to reach this point, even bushwhacking our way to a river thinking we were within 60 metres of the falls. We turned back as it was getting a bit late for us to venture of trail. It was only on the way back did we find the waterfall! Driving: From St. Pauls Cathedral, it’s an approximately 12 minute drive to the start of Nichols Falls. There’s a small carpark on the opposite side of the road to the trailhead. If this carpark is full, you’ll need to park further down the road where it’s safe to do so. Walking: If you’re walking from the city, it’s not unfeasible at ~6km from St. Paul’s Cathedral in the city centre. Public Transport: The best way to get to the Nichols Falls is to get the 3 bus from here on George Street and get off here at Fulton Road. From here, it’s about a 1km walk to the trail head. What About The Dunedin Glowworms? You can see glow worms here but we wanted to get to the campsite before it was pitch black so didn’t hang around to wait for them. At the entrance to the track, it says it’s a 7-minute walk to them, which is the most it’ll take. You need to keep following the track (no turnoffs required), until you hit the creek. There does seem to be a viewing platform where I suspect you’ll be able to see them from. You can walk along the creek bed, but you’ll need a good quality headtorch for safety reasons. I haven’t spent any time in Dunedin so can’t comment on this city, but if you’re looking for a quick Dunedin escape, the Nichols Falls are worthy of your time. Especially on dusk so you can hang around for some glowworm action after dark.